I never used to buy sambar powder. I buy fresh ingredients and get it ground in the flour mill. It stays fresh for 4-5 months. Homemade sambar powder not only gives a nice flavor to the dishes but is also very economical. I have given two measurements for sambar powder. The first one is my mother's recipe and the second one is my aunty's recipe. Today we will learn how to make sambar powder and rasam powder at home. This is my mother's measurement which I usually follow.I have given in cup measurements and gram measurements. I used standard measuring cup to measure all the ingredients. Clean and dry everything in the sun for 2-3 days and ground it to a fine powder from a grinding mill/flour mill. Store it in an air tight container. It will stay fresh for 5 months. This is my Perima's sambar podi measurement. I do not follow this but have given you as you will get more quantity and it is less spicy. Dry everything in the sun for 2-3 days and ground it to a fine powder from a grinding mill. Store it in an air tight container. Dry roast everything separately and get it ground to a fine powder from a flour mill. Store it in an air tight container. Amazing effort. Can you explain what's the difference between the two recipes of Sambar Powder. Tha ratios of ingredients is quite different. Dear PS, Thank you very much for the compliments.There in not much difference in taste between the two sambar powder.The first recipe is my anunty's and the second one is my mother's recipe.I have tried both and there is not much difference but for the sake of others I have given both so that they can prepare whatever is convenient for them. Yes, you are right. First one in the box is only my mother's recipe. By mistake I have mentioned it the other way in the comment. yhank you so much for this recipes. thanks a lot.i love yr recipes. ur creativity with recipes in the pic is awesome!i like it. hi padhu,,am very much happy with ur blog...since i am in US can i grind the sambhar powder in blendor.but the powder wont be fine..is that ok? will it affect the taste? It is very difficult to grind it in the mixie. If you are in a place where there is a flour mill, then get it ground in the mill or else reduce the quantity and grind it in mixie. 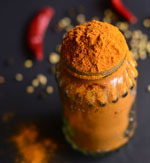 Since turmeric is very difficult to grind it in mixie, you can buy ready made and mix a little. You have an Arachu Vitta Sambar Recipe which does not need sambar powder. Hello you are a Wikipedia of Tamil cooking at least for bachelors like me. Thanks padma akka for this very useful post. As per the recipe, i followed the measures & method exactly and i made rasam powder justnow.The flavour of rasam powder is filled in the entire house of mine and i feel like having rasam rightnow.I came here just a week ago and still need to get many imp grocery items in the weekend and from monday onwards dhinam oru rasam thaan.Indhe website engele mathiri bachelors kku oru periya varam.i like each and every recipe from this website. Thanks padhu akka for this useful post and i share my feedback once i make rasam with this rasam powder on monday. Hi Padhu, what if I have all the above different ingredients in powdered form (barring the dals). What would the proportions be like. Please suggest. Thank you.Your recipe made cooking easy. Padhu!!!!!!!.... Sema... Sema... Seriously useful complete veggies receipt... Esply i liked the categories festivals... Very easy way to cook... Love it.. I wish padhuskitchen go on well... I also suggest to the list as "amavasai recipes, ekadesi recipes, dhuvadesi recipes and sravanam recipes"
Your receipes are simply superb..ive tried so many of your receipes. ..my husband and my kids enjoyed them! !! though I belong to andhra, am a huge fan of tamil brahmin sambar n their dishes as I had my schooling there....all the best from me and my family members too..
( the other variety of turmeric) . You have use the stick variety shown in the picture.It is call virali manjal. The round one (ball type) is for face. Do not use that. Thanks for your clarification.Trying it in a day or two but no doubts about the quality of the podi I am going to get. Becoming more and more addicted to kitchen with your recipes. Unlike other recipes, here no cooking skill is involved and I think the proportions given are the best we can get for sambar powder. Since the weights are also given,it was very easy for me to gather the items and grind.The Golden brown color and the aroma was mesmerising. Now I am on my own to make the sambar powder.Super recipe rather superb proportions. kala - You can dry roast the ingredients on medium flame and powder it. You will get fine powder in Indian Mixie. About turmeric- if possible you can pound the turmeric sticks into small pieces and then grind. I follow only my mother's recipes. I have given 10-12 sticks of manjal- you can add 1/4 cup flat of turmeric powder .This is just an approximate measure. Hi I prepared sambar powder (in mixie ground) but the color is not that much red why? Can u tell me please? Do not bother about all that Kala. It might be due to the variety of chilli. I am a Punjabi living in Bangalore for the last 40 years and we cook a fair amount of South Indian foods. With all humility I must say for stomach upsets and fall in appetite or poor metabolism South Indian combination of Rice with Sambhar, then with Rasam and finally with curds is the best and quickest get me back food. Reading your receipes fhas added to my knowledge. It would help many if you explained the role of each ingredient mentioned. In first recipe for Sambar Powder, proportions differ if measured by cup. Coriander seeds is 4 cups equals to 350gm while as Toor Dal measured 1 cup equals 250gm. kindly clarify. The measurements are correct. This recipe is 3-4 generation old. My mother uses "alaku". I have used my measuring spoons and cups. Here goes the original recipe of my mother - Red chillies-1/4 kg, Coriander seeds-4 alaku, tur dal-1 alaku, black peppercorns-1/2 alaku, cumins seeds-1/2 alaku, fenugreek seeds-2 tsp and turmeric sticks - 10-12. That's it. I am using this recipe for years. Hi Padhu. I'm a regular. You have shown pictures of chana and urad dal but they are not part of recipe? Also, is sun drying enough, I mean, no dry roast(for sambar powder)? Channa dal and urad dal are in the second recipe .I follow only the first recipe in the box which is my mother's recipe. Dry it well in the sun for 2 days- that is enough. But if you are in a place where there is not enough sunlight, then you can dry roast it otherwise not needed. Hi Padhu, I am a big fan of your blog. When I got married two years back I knew only to make maggi noodles. With the help of your recipes I am a decent cook now. I have a small doubt. Recently my mom made Sambhar powder with certain measurements but the chilli she used was too hot and hence for the same measurement its too spicy and the chili overpowers the flavor. I am in US and I am not sure how to adjust the powder now. Any suggestions? 2. Dry roast some coriander seeds and any other ingredients she uses in Sambar podi like tur dal, cumin seeds etc powder it finely and mix it with the rest. This might help. hi padhu .. i am a big fan of your blog.. can you send the measurement for sambar poweder and rasam powder in cups instead of grams. Check the ingredient box - I have given cup measurements also for the first recipe which I follow. Hi padhu, i am a big fan of your blog. For any recipe i am referring only your blog. I thank you so much everytime i make the dishes and get appreciations. I wish you all the very best in your life. I need one clarification for preparing sambhar powder which red chillies to use Gundu milagaya or neettu milagaya? Thank you so much Malathy. I am glad you found my website useful. Regarding your doubt - I use only long variety (neettu milaga) as shown in the picture for sambar podi. Ever since I got married, Ve been following your recipes to the T. This blog s like a mine of gold. Awesome recipes. Loved the Persian dill rice and murukku recipes. I have a doubt. For sambar podi, can we avoid using manjal altogether? Will it affect the taste? Please help me with this. Thank you so much Dhamayanthi. Feeling very happy to know that you love my blog and recipes. Do not avoid turmeric as it is very good for health. Regarding taste, I am not sure but turmeric gives a nice color to the dishes. If you cannot get that stick manjal, you can add/use turmeric powder.You can mix it with the sambar podi. Hi Padhu...Ur recipes r jus awesome...U r my cooking encyclopaedia... Whatever I want I get it here...My best wishes to u!!! Not necessary. Grind it to a fine powder. I am a proper north Indian, but brought up and educated in south. 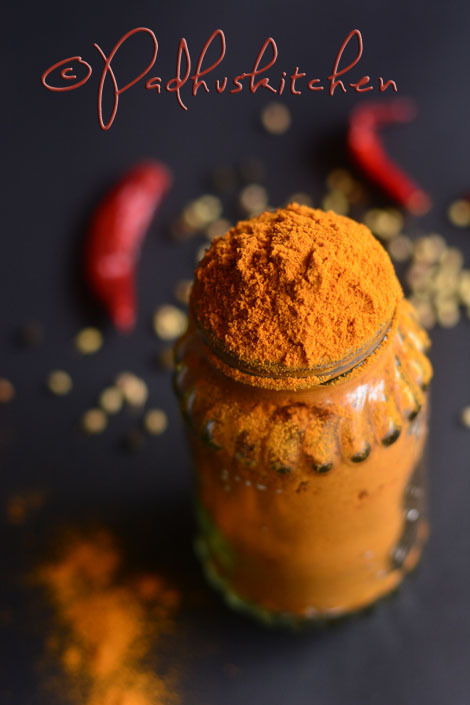 I just love south Indian food, I tried your Perimas' sambhar powder, but increased the red chilly measure by 75 grams and you know what its absolutely awesome... I think you should mention that in your recipe here for people who love smoking sambhar.... Thanks for the recipe and post some more recipes from Perimas' secrets !!! Really!! Even I have not tried her Sambar powder. I prepare and use only my mother's recipe. I want to try and make a small quantity to try first. 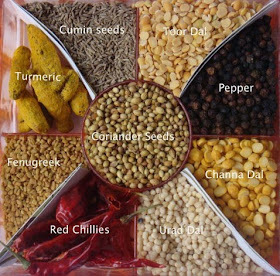 Can you let me know if the below measurements are correct: Red chilly 8 pods, coriander 2 tbsp, Turmeric 1/2 tsp, channa dal 1/2 tsp, Toor dal 1 tsp, pepper 1/4 tsp, jeera, 1/2 tsp, fenugreek 1/2 tsp. You can half the above quantity. You can try with your measurements also with little changes. Reduce fenugreek to 1/4 tsp. did you mean half of what judith wrote ? or half of your sambar podi measurements ? Padhu, Thanks for sharing your tried and tested generations old recipes. Do you have a recipe for Idly podi. pls share . Kuttygayu- I have given cup measurements also in the ingredients list. Kindly check well. I use Standard measuring cups and spoons. Judith measurement is not my sambar podi measurement. Can u give the sambhar podi measurement for preparing ur drumstick Sambhar as we are not having sambhar regularly this will b too much for us. Please help. I want to ve really good sambhar n thats possible with ur recipe. Can u give measurements to prepare podi at the moment n use. Or smaller quantities. Thanks in advance.